In 1832, Dr. Hartwell Carver wrote an article for the New York Courier & Enquirer advocating the construction of a railroad from Lake Michigan to the West Coast. The railroad would open up western territories to settlers, facilitate trade with Asia via port facilities on the Puget Sound, and help unify the growing United States. The New York physician and businessman was not the first to propose the railroad; some pamphleteers had done so as early as 1830. But, he was among the most vocal and high profile of those who wanted to use the newly invented steam engine to push the United States to the West Coast. Carver would fight for decades to get a transcontinental railroad built. Like many visionary ideas, this one was just slightly ahead of its time. The technological, economic and political stars required to build such a monumental infrastructure project were just not aligned yet. Railroad technology was still fairly primitive, the terrain was difficult, the costs would have been high, and there weren’t all that many Americans out there to serve. 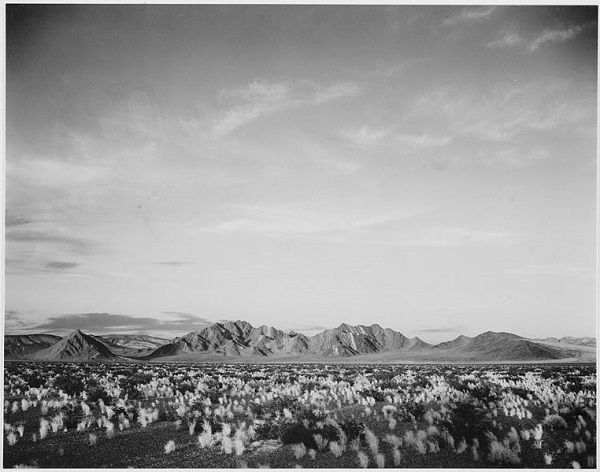 Many of Carver’s countrymen viewed much of the West as a howling wilderness filled with vast deserts, forbidding mountains and hostile native tribes. This view of the West wasn’t accurate. But, it did point to a fundamental economic issue that Carver and other early railroad advocates had a difficult time addressing. Was there really a strong demand for a transcontinental railroad? What would be the return on investment? Would the line thrive? Or would it collapse into bankruptcy due to high costs, low usage and poor revenues? The business case just didn’t close. There was a lot more low hanging fruit to pick in the East — railroads that could be built between existing towns and cities that would return handsome profits to their investors. Complicating Carver’s plan were problems of sovereignty. There were two territories – Oregon Country and Alta California – that could provide a West Coast terminus and port facilities for a transcontinental railroad. But, the United States did not control either of them. Under an 1818 agreement, the United States and Great Britain had agreed to joint occupancy of Oregon Country, a vast area stretching from California to Alaska that today makes up the Canadian province of British Columbia and the U.S. states of Oregon, Washington and Idaho and parts of Montana and Wyoming. The two nations had sharply contrasting opinions about where the boundary between the United States and British Canada should be drawn. The U.S. claim extended all the way up to nearly Alaska, while the furthest extent of the British claim for what they called the Columbia District touched the northern border of California. The joint occupancy didn’t make a railroad impossible, but it did complicate matters relating to funding, routes and other vital issues. When the Transcontinental Railroad was eventually built, the U.S. government granted vast tracts of land to the two companies building the line. That would have been a much more difficult thing to do given the competing border claims and the need to negotiate with both Washington and London over the route. South of Oregon Country lay Alta (Upper) California, a vast territory with ports at San Diego, Los Angeles and Yerba Buena (later renamed San Francisco) that could serve as destinations for a railroad. But, Alta California was Mexican territory, which made building a railroad across it more difficult. By the 1840’s, Americans began to outnumber British residents in Oregon Country as more settlers made their way west along the Oregon Trail. Tensions over how to ultimately divide the territory increased as the two nations drifted toward what threatened to become their third war in 70 years. Meanwhile, Americans were casting a covetous eye on Alta California and other Mexican lands in the Southwest. The term manifest destiny was coined in 1845 to describe the belief that America had the right and the duty to expand its civilization across the North American continent. These issues came to a head during the presidency of James K. Polk, who during his single four-year term presided over the acquisition of more territory than any other American chief executive. 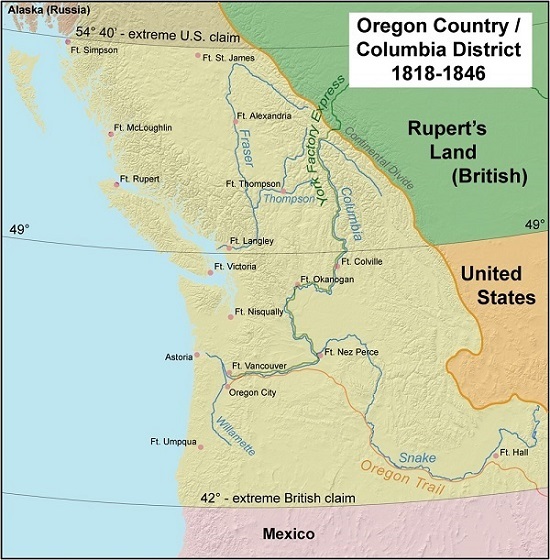 During the 1844 campaign, his supporters used the slogan, “Fifty-four forty or fight” to indicate where the Oregon Country boundary should be drawn at 54°40′ north by either treaty or war. Ultimately, the U.S. and Britain opted not to fight over Oregon. The nations negotiated an amicable compromise in 1846 over their competing claims that extended an existing border along the 49th parallel westward to the coast. It remains the boundary between the U.S. and Canada to this day, part of the longest undefended border in the world. The Southwest was a different matter. In 1845, the United States annexed the Republic of Texas, which had broken away from Mexico nine years later. The following year, Polk provoked the Mexican-American War, which the United States won decisively. 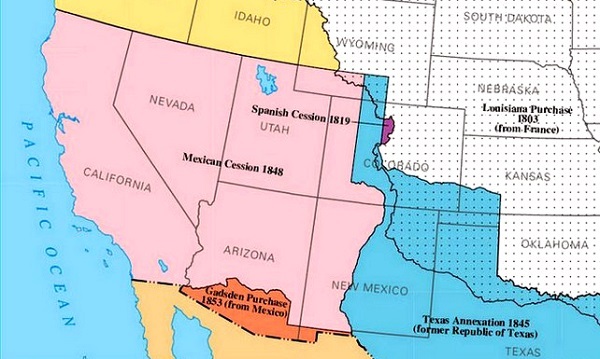 Mexican cession of land to the United States in 1848. In the Treaty of Guadalupe Hidalgo of 1848, Mexico ceded Alta California to the United States. The vast territory included what later became the states of California, Nevada, and Utah, and parts of Arizona, Wyoming, Colorado and New Mexico. 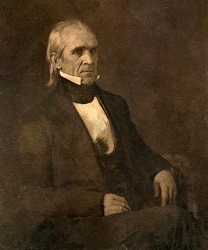 With America having fulfilled its manifest destiny to expand across the continent, Polk left office after one term as president on March 4, 1849. He died three months later after a retirement of only 103 days. Miners during the California Gold Rush. As if to put a giant exclamation point on the nation’s vast territorial expansion, workers discovered gold at Sutter’s Mill in Northern California in January 1848. As word of the find spread across the country and world, people by the hundreds of thousands pulled up stakes and headed to seek their fortunes in California. It was not easy. Crossing the country by wagon train took months and presented all sorts of dangers to life and limb. It was an arduous and expensive journey. Or travelers could brave Cape Horn by sailing around South America on a perilous voyage that could take five to eight months. The alternative was to sail to Central America, make a trek across jungles teeming with tropical diseases, and board another ship for the trip up the coast. The Panama Canal was 60 years in the future. 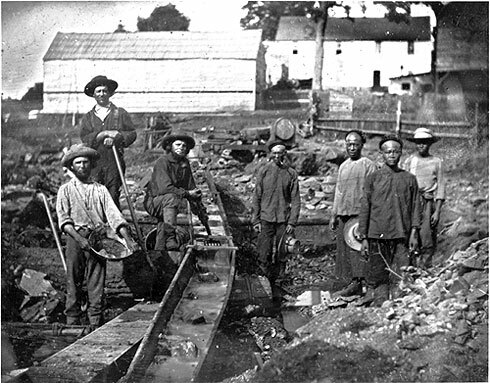 Despite the hardships, an estimated 300,000 people sought their fortunes in California during the Gold Rush. Although many people would return home empty handed after a few years, the influx of settlers quadrupled the new state’s population from 92,597 in 1850 to 379,994 in 1860. An additional 52,465 people lived in neighboring Oregon, with 6,857 residing in Nevada by 1860. Although California’s population was smaller than in many Eastern states, it was still larger than those of Delaware, Florida, Kansas, Minnesota, Nebraska, New Hampshire and Vermont. And while the eastern half of the nation was served by an extensive and growing network of rail lines, California and Oregon were not. The case for a transcontinental railroad was growing stronger. A north south West Coast route that would connect San Diego to Seattle. Despite an agreement in principle, Congress became gridlocked over which route to fund. Substantial economic benefits would accrue to whichever city served as the eastern terminus. Northern business interests favored the northern and central routes, while Southerners favored the routes that ran through the south. The idea of sending their cotton and other goods north to have them shipped to the West Coast particularly rankled Southerners. The debate over the railroad took place against the backdrop of increasing North-South tensions over slavery. The slavery issue was exacerbated by the nation’s recent territorial expansion. The Kansas Nebraska Act of 1854, a crucial step in organizing land through which a railroad might pass, deeply divided the nation by allowing residents of those territories to decide whether they would enter the Union as slave or free states. Violence between pro- and anti-slavery factions erupted in what became known as bleeding Kansas. 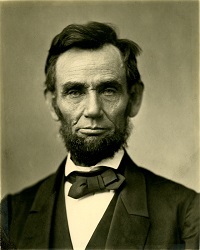 The slavery issue reached a breaking point with the 1860 election of Abraham Lincoln, who headed the new anti-slavery Republican Party. The Civil War broke out the following year as Southern states seceded from the Union and formed the Confederate States of America. With soldiers dying in the bloodiest war in American history, one would be excused for thinking Lincoln’s Union government would be too busy trying to put the country back together to worry about building a railroad to the West Coast. But, the war actually accelerated the project. The departure of southerners from Congress eliminated the gridlock over the route. There were also secessionists groups in California threatening to pull the state out of the Union, possibly taking Oregon with it. The Union government believed a transcontinental railroad would help quash these sentiments by linking California and Oregon to the Union militarily, politically and financially. Thirty years after Dr. Carver’s editorial appeared in a New York newspaper, the construction of a transcontinental railroad was finally under way. It would take seven long years to make his dream a reality. Tomorrow: The Road to Promontory: Oxbow tracks, self-dealing and a golden spike provide a preview of the Gilded Age. Great start to the series Doug. I always like to remind people that the Transcontinental Railroad was completed THE SAME YEAR as the Suez Canal. If an idea is worth doing (improved access for East Asian goods to American and European markets) then more than one group will have it. It was the zeitgeist of the 1850s/60s. Good stuff Doug look forward to reading the rest. Doug, There are two errors in it. The Cape of Good Hope is at the southern tip of Africa. Cape Horn is at the southern tip of South America. Also Texas was a independent nation for 9 years, not 8. It was from 1836 to 1845, at which time it joined the U.S.
Corrections made. Thank you, Thomas. A good read so far, Doug. Glad to! This is a great article and I look forward to the rest of the series. Great series. Of the several attempts to open frontiers using railroads the Transcontinental Railroad was by far the most successful. The Canadian Pacific Railway was also quite successful, but the TransSiberian, TransAustralian, Cape to Cairo, and Alaskan were only of limited success just bringing development to a narrow band (railbelt) along the railroad route. Among the reasons the Transcontinental was so successful was the use of land grants, a supporting legal framework with the Homestead Act (1862), Morrill (land grant colleges) Act (1862), the Mining Act of 1872 and even the Northwest Ordinance of 1787. The framework of military forts, telegraph lines and mail coach routes also was critical in providing an means to expand activities from the railbelt. Finally, the country after the Civil Was ready to go west and leave the bad memories of the war and politics of the eastern states involved in it behind to start over. This is important to understand and I am glad Doug is doing a series on it. Opening and economically developing frontiers is a complex process and transportation is only one element of it. But this view of the west WAS accurate. There were many hostile tribes, the Rockies were quite forbidding (I’d be interested in watching someone who says they aren’t take a wagon over them on a dirt track), and compared to the lushness of the eastern US, the deserts in the southwest and northwest were vast (and forbidding). the 1 issue that I have with this is that we got land from Mexico in the Mexico Cessation. It was NEVER mexicos. There were still MILLIONS of native Americans running around in this are, fighting against New Spaniards/Mexicans. OTOH, The southern invaders were less than 5% of the population within that area. When you do not have even 5% of the population under your control and you have everybody in forts, then you obviously do not own that land. Simple as that. All America did was get Mexico to quit TRYING to make it theirs. Oh, and it was not America’s land until late in the 1800s. Prior to that, it remained native American. However, history books being what they are…..
not just land grants, but the fact that they were PAID to build those rails out. I did not realize that the Suez was that old. AND in 2016 the New Suez Canal and Panama Canal Expansion both opened. Union Pacific finished upgrading the Sunset Limited (LA to New Orleans) to double tracks around the same time, effectively quadrupling the amount of freight the line could carry (to better compete against the Panama Canal, moving containers from China to the port of New Orleans). Like I said, when an idea is worth having, everyone gets in on it. Not exactly.They received funds per mile from low interest government loans they had to pay off. The federal government at the time was too poor to paid directly for this type of project, especially with the need to pay for the Civil War. These loans provided additional incentives to find revenue sources. The loans were also offset by providing transport for the military as needed.